CNET UK has reviewed the latest Samsung competitor to the Micro Four Thirds cameras. The camera is called Samsung NX100 and is the second camera from Samsung in their NX-line. 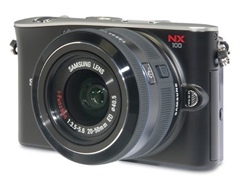 CNET UK ends up giving the Samsung NX100 a good review with an overall score of 4 out 5 stars. There are several positive points with this Samsung camera including very good AMOLED screen on the back of the camera, fast and responsive, good controls and lightweight. But there are of course some negative points too since it did not get a full score and they are no built-in flash or viewfinder, plasticly body and the control wheel could be better. It seems like the reviewer find the camera from Panasonic and Olympus is better. Hopefully Samsung will release even better cameras later on with their NX-line. Read the full review of the Samsung NX100 system camera here.